Backpacking Background: I started backpacking this year after moving from the prairies to the Kootenay region of British Columbia. I’m new to backpacking but I have significant outdoors experience having enjoyed camping and day hiking for many years. My trip length is generally one to three nights and ranges from prairie hikes to mountainous terrain. I am a 3-season hiker at present but I plan on extending my trips into the winter season as I pick up more gear. 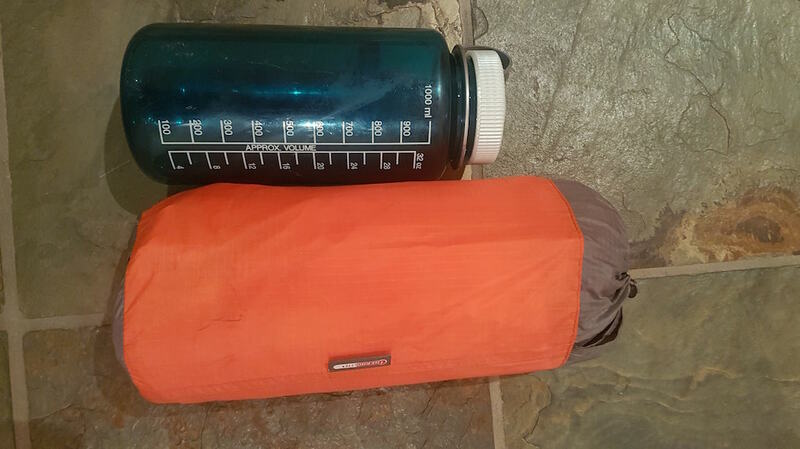 My pack weight varies depending on the trip, but I tend to sacrifice weight savings for comfort. The Sea to Summit Ultralight Insulated Mat comes in a stuff sack with dimensions of about 11 in (28 cm) long and 4 in (10 cm) wide when stuffed. Inside the stuff sack was the mat, a sea to summit brochure, and a repair kit with repair instructions, 3 square-shaped repair patches and 3 circular-shaped repair patches of varying diameters. 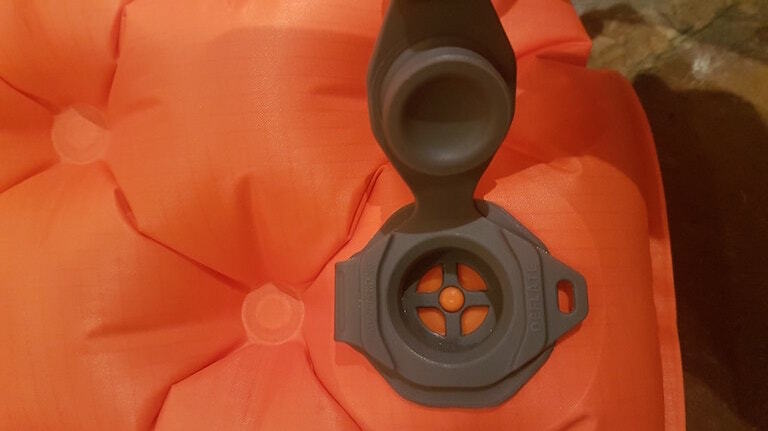 The Sea to Summit website indicates the mat should also come with a spare silicon one-way valve insert but mine did not. The mat is made of 40D rip-stop nylon face fabric as well as "Exkin Platinum" fabric which is described on the Sea to Summit website as "a very lightweight and quiet non-woven fabric that has a thin metalized layer applied to the surface... that reflects warmth back to the user to minimize radiant heat loss." The mat also contains "THERMOLITE" insulation inside the "Air Sprung Cells". Liquid Thermoplastic polyurethane lamination is used to bond the fabrics of the mat. The mat is designed with a single layer of Air Sprung Cells which gives the mat a resemblance to a conventional mattress. The Air Sprung Cells are described on the Sea to Summit website as "operating in the same way a pocket spring mattress would... with each cell deforming independently and conforming to your body shape with more body contact area and even dispersion of pressure." The mat is designed in a tapered oval shape, with the tapered end at the feet. The specifications on the website note there are 181 Air Sprung Cells (I have not counted them myself). 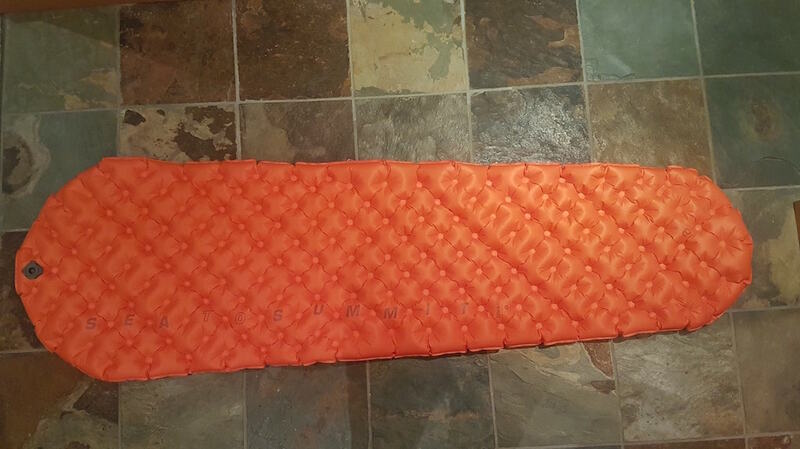 I have used this mat on several overnight backpacking trips in the Kootenay area of British Columbia: 3 trips, 6 nights total, temperatures between 5-30 C (41-86 F), dry conditions, rocky and/or forested terrain in the alpine and sub-alpine up to 2850 m (9350 ft) ASL. I have used the mat on one backpacking trip in Saskatchewan for 1 night: temperatures between 10-33 C (50-91 F), windy, dry prairie, rolling terrain, 800 m (2600 ft) ASL. I also used the mat on a two night trip to Strathcona Provincial Park on Vancouver Island: temperatures between 10-25 C (50-77 F), dry conditions, rocky and forested terrain at elevations between 1000 m (3300 ft) and 2100 m (6900 ft) ASL. The mat functioned well on each of these trips. Stored in its stuff sack, it strapped easily to the bottom of my backpack. It takes about 3 minutes to set up including unrolling and inflating it. 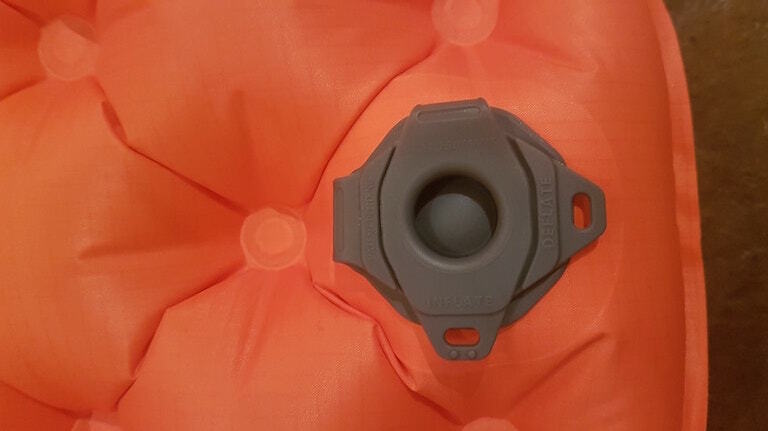 The one-way valve makes inflating it very simple as I don't have to worry about air escaping between breaths. When I purchased it I did not know it had a one-way valve and, being unfamiliar with one-way valves, I did not understand how to inflate it. I searched for inflation instructions (which it does not come with) and eventually just gave it a try. Once started, I understood it was a one way valve and it was easy to inflate. However, it was not intuitive for someone unfamiliar with one-way valves. I found the mat very comfortable, even when sleeping on rocky ground. I am primarily a side-sleeper and was looking for a mat that would prevent my hip and shoulder from contacting the ground while on my side; this mat does just that. Occasionally I would wake in the night to find my legs had slipped off the side of the mat but this did not bother me - I would simply re-adjust the mat - which takes about 30 seconds - and go back to sleep. However, next time I will likely purchase a mat which is not tapered to help prevent this. The mat has an R-value of 3.3 which is a resistance to heat loss value rated for early spring/late fall with possibility of hard frost. I always found myself to be warm at night but have not tested out the mat in freezing temperatures. The Sea to Summit Ultralight Insulated Mat is very comfortable, light, and durable. The one-way valve is not intuitive but once understood I found it very convenient and easy to use. The mat packs down quite small and fits easily inside my backpack or strapped to the outside of my bag. I don't love the tapered shape as I find my legs occasionally slide off the mat but I recognize the shape likely provides weight-savings. I would highly recommend this mat. 3. Comfortable, and protects hips and shoulders from touching the ground when side sleeping.